Autumn at Deboullie Pond. Photo courtesy of Red River Camps. 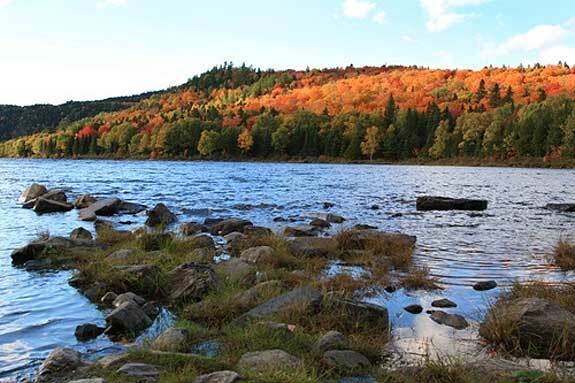 The remote Deboullie Public Reserved Land in Aroostook County provides an authentic wilderness experience. With sheer cliffs, rugged mountains, and tall forests, this fascinating landscape draws in outdoor adventurers. The 21,871-acre public land area is just 30 miles from the Canadian border. The land features 17 ponds with brook trout, landlocked salmon, blueback trout, and lake trout, making it popular with fishing enthusiasts. The area also offers a 12-mile trail network with blueberries, ice caves, waterfalls, marshes, and bogs. The Deboullie Public Reserved Land is part of the North Maine Woods organization, which charges a fee for day use and camping. Contact 207-435-6213 for more information about current rates. Eagle Lake, located in northern Aroostook County, is best accessed from Sly Brook Road, which connects to Route 11 at Soldier Pond in Wallagrass. The land can also be accessed via boat from the Eagle Lake boat launch. This public land unit comprises 23,000 acres, including most of Eagle Lake itself. Visitors enjoy ATV riding, fishing, hunting, hiking, cross-country skiing, snowmobiling, snowshoeing, swimming, and viewing wildlife. There are several campsites available for use, all of which are accessible only by watercraft. Use of the land is free; call 207-435-7963 for more information. Round Pond, located in remote Aroostook County in northern Maine, provides an excellent backcountry experience. The pond is actually a wide section of the Allagash River, and the Public Reserved Land comprises 20,000 surrounding acres. This area offers a true backcountry experience, with few visitors, unmarked roads and trails, and abundant wildlife. Round Pond sustains a population of white perch, yellow perch, brook trout, and some salmon. Hikers enjoy climbing Round Pond Mountain, which offers spectacular views of the river system and forests. Look for Tornado Path, a section where a strip of trees were destroyed by a tornado; younger, lighter-green trees now fill in the path. Because Round Pond Public Reserved Land is so remote, it is essential to be well-equipped and let a loved one know your travel plans. A small fee is charged to use the land, and the area is open year-round; call 207-435-7963 for more information. Scopan Public Reserved Land, located between Ashland and Presque Isle in Aroostook County, comprises some of the most difficult and rugged terrain in Maine. The 16,700-acre land unit includes 1,400-foot Scopan Mountain as well as nearly 10 miles of shoreline along Scopan Lake. The land also features rolling hills, wetlands, a small pond, and several remote brooks. There is a trailered boat launch and picnic area for visitors. Many people use the land for hiking, camping, snowmobiling, canoeing, fishing, cross-country skiing, snowshoeing, and swimming. Access the property by taking a gravel road off of Route 163 just west of Presque Isle. Entrance is free year-round; call 207-435-7963 for more information.